Today I am going to share a nice back to school project that I have done with my students the past two years that gets them thinking of our classroom as a safe space to share about books. The students take book "shelfies", which is basically a selfie taken with a book in hand. I am not sure what took me so long to write about this, but I figure even two years later is better than not writing at all ;) So here we go. After the selfie is done, the students write a paragraph detailing themselves as readers. Do they enjoy reading? Why or why not? What types of books peak their interest? What genres would they like to explore? What books do they not tend to pick up in the library? I want them to write about themselves as a whole, not just one specific book. Then, I display all of this on the board so that all can see the books that were brought in as well as get to know their fellow readers. More than one student has been turned onto a new book because of the shelfie that they noticed on the board! Have you done something like this before? Please share below! Thanks for sharing a great activity. The iPad template doesn't seem to work, though. It opens up blank. :/ I will definitely try this out at the beginning of the year. Thanks so much for this great idea! I can't wait to do this with my new students this fall! I love this idea but can't get the template to open either. Can you help? Thanks for sharing this. Oops! Got it! :-) Thanks again. Thanks for sharing! What a great way to share a buzz about favorite books and embrace a reading life! I would love to do this idea. Why can't I get the template? I love this idea as well, but can't access template. Any help? Thank you! This is a great display! 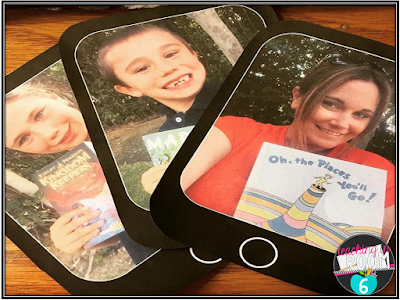 Cute way to personalize and boost self-esteem, besides emphasizing being readers for life! I would like to personally congratulate you as your blog Teaching in Room 6 has been selected by our panelist as one of the Top 50 Fourth Grade Teacher Blogs on the web.